"Mesmer" redirects here. For 1994 film, see Mesmer (film). Franz Anton Mesmer (May 23, 1734 – March 5, 1815) sometimes incorrectly referred to as Friedrich Anton Mesmer, was a German physician with an interest in astronomy, who theorised that there was a natural energetic transference that occurred between all animated and inanimate objects that he called animal magnetism, sometimes later referred to as mesmerism. The theory attracted a wide following between about 1780 and 1850, and continued to have some influence until the end of the century; it is now almost entirely forgotten. In 1843 the Scottish physician James Braid proposed the term hypnosis for a technique derived from animal magnetism; today this is the usual meaning of mesmerism. Mesmer was born in the village of Iznang (now part of Moos), on the shore of Lake Constance in Swabia, a son of master forester Anton Mesmer (1701—after 1747) and his wife Maria/Ursula (1701—1770), née Michel. After studying at the Jesuit universities of Dillingen and Ingolstadt, he took up the study of medicine at the University of Vienna in 1759. In 1766 he published a doctoral dissertation with the Latin title De planetarum influxu in corpus humanum (On the Influence of the Planets on the Human Body), which discussed the influence of the Moon and the planets on the human body and on disease. This was not medical astrology—relying largely on Newton's theory of the tides—Mesmer expounded on certain tides in the human body that might be accounted for by the movements of the sun and moon. Evidence assembled by Frank A. Pattie suggests that Mesmer plagiarized his dissertation from a work by Richard Mead, an eminent English physician and Newton's friend. That said, in Mesmer's day doctoral theses were not expected to be original. In January 1768, Mesmer married Anna Maria von Posch, a wealthy widow, and established himself as a physician in the Austrian capital Vienna. In the summers he lived on a splendid estate and became a patron of the arts. In 1768, when court intrigue prevented the performance of La Finta Semplice (K. 51) for which a twelve-year-old Wolfgang Amadeus Mozart had composed 500 pages of music, Mesmer is said to have arranged a performance in his garden of Mozart's Bastien und Bastienne (K. 50), a one-act opera, though Mozart's biographer Nissen has stated that there is no proof that this performance actually took place. Mozart later immortalized his former patron by including a comedic reference to Mesmer in his opera Così fan tutte. The scandal that followed Mesmer's attempt to treat the blindness of an 18-year-old musician, Maria Theresia Paradis, led him to leave Vienna in 1777. Miss Paradis had been blind from the age of four. Under Mesmer's care her sight was partially restored. Her parents were at first overwhelmingly grateful; but later, they insisted that Mesmer cease treating her. Bitter disputes followed, and the patient's vision again deteriorated. The following year Mesmer moved to Paris, rented an apartment in a part of the city preferred by the wealthy and powerful, and established a medical practice. Paris soon divided into those who thought he was a charlatan who had been forced to flee from Vienna and those who thought he had made a great discovery. The commission conducted a series of experiments aimed not at determining whether Mesmer's treatment worked, but whether he had discovered a new physical fluid. The commission concluded that there was no evidence for such a fluid. Whatever benefit the treatment produced was attributed to "imagination". It was mostly due to these internecine struggles of an economic nature which plagued the Harmony Society, that Mesmer, feeling that the figures recorded in its accounting books were being intentionally tampered with, decided to settle for 20000 francs and leave the country. He made this decision in 1785, boosted by a hefty sum he was able to carry along. Once he was gone, his opponents went on a rampage, causing Mesmer to spend a lot of time writing retorting libels which targeted their accusations. In 1785 Mesmer left Paris. In 1790 he was in Vienna again to settle the estate of his deceased wife Maria Anna. When he sold his house in Vienna in 1801 he was in Paris. The creator of mesmerism sympathized with many of the ideas the revolution had highlighted. The consequence thereof is that he had to forego the plan of settling back in Wien, since he was viewed as politically suspect, and he retraced his steps to Paris several times. In 1802, while in that city again, he asked for and was awarded a yearly allowance of 3000 florins as compensation for the money he had lost in the Revolution. In 1803, some of his friends solicited him to open up a new establishment devoted to the implementation of magnetic treatments, but Mesmer turned down their request. The war had consigned him to inaction; several friends of his had died, and he decided instead to take up residence in Switzerland. In 1809, he penned a letter to one of his friends, wherein he mentioned to him that he was spending a happy life of quiet and anonymity, untroubled by problems or by neighbours and people who could recognize him. He added in that missive, though, that he was still practicing his Art, and was always visited by plentiful patients, many of whom he would treat free of charge. In the meantime, the Academy of Berlin formally acknowledged the validity of Mesmer’s ideas and dispatched Prof. Wolfart to invite him to move to Berlin. However, Mesmer, who was by then an old man, was no longer keen to travel. Prof. Wolfart accordingly collected his memories, until Mesmer died in Meersburg, Germany, on 5 March 1815. The rapid spread of Animal Magnetism through Europe gave rise to further intense discussions on the origin of the phenomena. In France three different schools of thought emerged. They received different names: the fluidic one, the spiritualistic one (Chevalier de Barberin), and the experimentalist one (De Puysegur). Beside them, one of the branches of Animal Magnetism that rose after Mesmer was called the branch of the "Imaginationists" that put importance on the power of the "imagination". Abbe Faria, an Indo-Portuguese monk in Paris, emphasized that “nothing comes from the magnetizer; everything comes from the subject and takes place in his imagination i.e., autosuggestion generated from within the mind”. Perceived dangers of mesmerism, through the powers of the mesmeriser over the patient, were explored in a sensational English novel, Sturmer: a Tale of Mesmerism (1841) by Isabella Frances Romer. Among Mesmer's followers was Armand-Marc-Jacques Chastenet, Marquis de Puységur (1751–1825), who discovered induced or artificial somnambulism. In his early writings, F. Anton Mesmer used a way of exposing his ideas very similar to the way of writing of the ancient alchemists. His way of thinking shows clearly the influence of the alchemists' ideas. He sees three basic elements: God, Energy (movement), Matter (on the top left in the guide to the symbols. The idea behind it is that images are the basis for a true understanding while instead words can lead to many different and opposite meanings. The multiplayer online Mesmer, which focuses on illusion and hypnotic spells. George R. R. Martin's Fevre Dream, a vampire novel set in the 1800s, contains repeated references to Mesmer's work by a protagonist interested in understanding vampires from a scientific perspective, particularly their supernatural ability to impose their will upon others. Mesmer's attempts to cure the musician Maria Theresia von Paradis of blindness in 1776–7, with the use of magnets, is fictionalised in a short story called "Harmony" by Julian Barnes, in his 2011 collection Pulse. Mesmer magnets are shown in the popular show Warehouse 13. "Report of the Commissioners charged by the King in the examination of Animal Magnetism" (originally published 1784), English translation in Skeptic magazine of the Skeptic society, vol 4 no 3 1996. 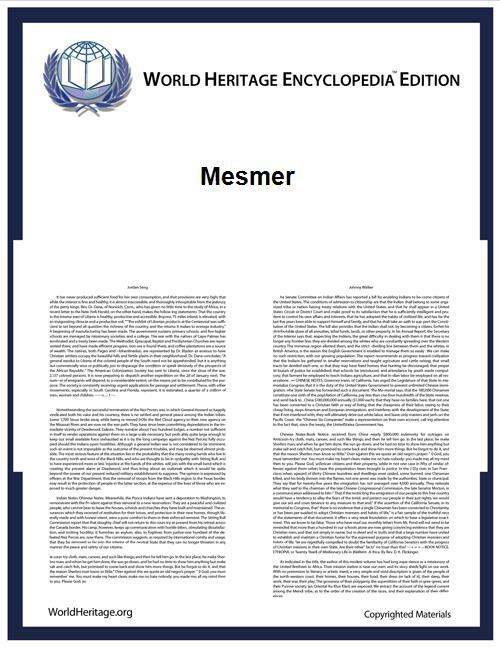 Commons has media related to Franz Mesmer.